The 2016 maple syrup season was unique, in that life intervened at the end of it, forcing us to shut down more sloppily than other years. I like to get things cleaned and put away soon after the last tap is pulled, so I’ll be ready for the next season. I did get my buckets and lids in the basement early on, but unfortunately they sat until today. I’d been playing a phycological game with myself for the past many months. The more I tend to put things off, the bigger the wall becomes keeping me from getting started. So they sat and waited, patiently, in the basement, mocking me each time I walked by. And once I put my Muck Boots ™ on (the floor in the basement is cold this time of year) ran the water, and started working, the job was completed in a couple of hours. I had to scrub harder due to the elapsed time, but that was my punishment. I have a couple of habits when I’m doing relatively mindless repetitive tasks. Franco helps with the first one… he brings his rubber ring over, lays is on the ground hopefully in front of me, and stares at it with a slow tail wag. I kick the ring for him numerous times during the session, and to date, I’ve never managed to tire him out. The second habit is to grab my Bluetooth speaker, pair it with my iPod, and listen to some podcasts while working. For a guy that can typically only manage one thing at a time, I sometimes surprise myself by keeping these three juggling balls in the air at once. The project was moving along well. My rubber gloves kept a reasonable seal. I changed my water/chlorine bleach washing solution often, and the clean buckets gleamed as the finished stacks grew. I was listening to “This American Life ™ when an episode came on titled, Tell Me I’m Fat. I listened to this podcast with great interest, since I’d just written a piece in my blog about the obesity epidemic. What I heard changed my opinion about the previous piece I wrote, and made me hope I hadn’t offended anyone with the ideas I’d expressed. The point I’d tried to make was that many of us are overweight because our bodies had evolved needing more exercise than many of us currently get. I still believe this to be true, but I regretted the edge the piece had to it… that overweight people were the way they were because of some fault of their own. It was not what I meant to say, but I’m afraid it may have came through in the piece. A couple of things struck me about the This American Life ™ episode. One statistic stuck in my mind, “Fewer than 1 in 100 obese people get thin and keep it off, according to one recent study, which tracked over a quarter million people for nine years.” A woman was interviewed for the program was in that group of people that have kept the weight off. She explained that phentermine (an amphetamine-like drug) had helped her with the original weight loss, and that she still took them “…for a few months at a time a year, or sometimes it feels like half of the year.” So among the few that have kept the weight off, the price at least one of them must pay is a long term addiction to drugs. I finished the episode confused and unhappy. And I felt determined to share a belief about psychological well being. Try to start each day with a goal of something doable that you hope to accomplish. End each day by taking a look at what you’ve accomplished, and pat yourself on the back. “Good job, tomorrow is another day.” We all have things we could improve in our lives. Some of our problems are obvious, some not, but everyone has room for improvement. These things happen in numerous small steps. Be your best cheerleader for the steps you make in the right direction, and never quit trying to make that next right step. You People Are Too Light! Local doctors are exasperated and some claim they may seek other professions due the stress of seeing such healthy people for their annual physicals. Over 1/3 of all adults in Houghton County, Michigan are obese. Of the top 10 causes of death in the United States, 6 have a component in obesity. Unless you smoke, probably the best thing you can do for your health is to lose weight. But how? Weight gain/loss is a factor of two things, exercise and diet. I grew up in a suburb, and can attest to the lack of physical exercise available. You drive everywhere you go. When you are too cold, you turn up the thermostat. You buy your groceries at the market. Entertainment is delivered to your home. Life here in the country is a bit different. During the summer we are outside a lot working in gardens, cutting, splitting, and stacking firewood for the next winter’s heat, cutting grass, walking, and all manner of physical activities (yes, those activities include swatting mosquitoes.) Winter sees snow to be moved, firewood to be carried, roofs to be shoveled, ashes to be dumped, and dogs to be walked. If we owned farm animals, the physical chores would increase. Come spring, the most physical season of all, maple syrup time arrives. Much of it is on snowshoes in the early part of the year. Some years the snow leaves early and the walking is easier, but some years there is snow to the end. There are buckets to empty into the storage barrel, firewood to carry, specific gravity to be tested, and finished product to be carried out of the woods. I’m suggesting a couple of things. The old model of factories surrounded by suburbs is rapidly becoming outmoded. Many jobs can be done from home. Homes could be spread out such that some acreage would be available. Firewood could be grown and harvested sustainably. Food could be grown in gardens and a few farm animals could round out much of a family’s diet. Like a lot of people, I’d sure rather just stay inside and rest all day. But when there are outside chores to be done, I’ve found that once I’m outside, one thing leads to another and pretty soon my heart rate is up. I get addicted to the flavor of our own squash, green beans, dried tomatoes, and garden onions. Besides the flavor, there is the satisfaction of knowing we’ve done a lot of it by ourselves. Humans are smart. We can do a better job designing the communities we live in. Some communities are already bike and pedestrian friendlier. Let’s figure out a way to live that encourages us to get outside and sweat a little. It would probably do most of us some good… except for Dean. We just got home from a very nice 5 day visit with Steve and John in West Virginia. We flew from our local airport to Pittsburgh, rented a car, and drove about 1 1/2 hours to their place. I’ve rented a lot of cars, so know most of the drill when it comes to the questions they will ask. As the clerk went down her list, I had the feeling she wished I’d be answering differently. I think they earn bonus money when they sign you up for these unnecessary options. By the end of our interaction, she was not at all friendly or helpful. Sometimes that is the way it goes. We left extra time because of our background travelling the roads in the unpredictable UP of Michigan weather. Although it was pitch dark this time of the morning, the roads were clear and dry and we made good time. At about 5:00 am, about 10 miles from the airport, we spotted what looked like an open gas station, so we pulled off to gas up. I made a mistake coming off the interstate, and wound up driving away from the gas station. Our GPS, as they will do, was yelling helpful suggestions about how I could get back on the interstate. I was trying to find a place to turn around, and none were presenting themselves. In the middle of all that, it started to rain, and it took me a minute to find the wipers on this rental car. I was getting rattled. We did turn around and get the GPS turned off. We found an open gas station in a pretty seedy setting. As I pulled in, a fellow at the pump next to mine looked up and stared at me. Thanks to the little arrow next to the gas indicator on the instrument panel, I realized I was on the wrong side, so swung around and parked at the pump. As I was filling up, the fellow next to me walked over and very politely asked if I could give him a jump. If you are like me, you like to get to the airport plenty early, get rid of the checked baggage, go through security, and find the correct gate. Once that has been done, little can conspire to keep you from your destination. The last thing I wanted was to get sidetracked in a stressful time. I told the guy this was a rental and I wasn’t even sure how to open the hood (true.) He seemed close to panic but was very polite and quiet. He explained, almost in a whisper, that the people in the cashier station said they could not help him. I walked up to the cashier to get my receipt for the gas, and determined that the people in the booth were probably not capable of jumping a car. By the time I got back to our car, I’d made up my mind. “Let me just open my hood to see what side the battery is on,” I told him. Once I figured it out, I pulled the car around to face my new friend’s car. He had a cheap set of jumper cables. He hooked up his end and I hooked up mine. He tried to start his car. Nothing but sparks. One quick word to the wise. 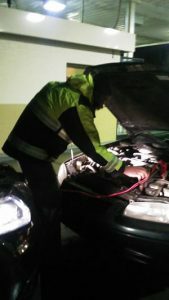 When a car battery is completely discharged and you put a lot of current through it, it can explode unexpectedly. It doesn’t go off like a bomb, but pieces of plastic and drops of battery acid can fly around. It is preferable to stand aside as the driver is cranking his engine. He tried several times but all we got was sparks and smoke. A sure sign this poor fellow had very dirty battery cables. The clock was ticking. My friend was sweating bullets. I walked up to the car and tried finding a better ground connection in the engine compartment. No good. I tried pinching the jumper cable clamps with my hand and rotating them on the battery terminal to clean off the gunk and come up with a better connection. Nothing, nothing, then vroom! “Yay!” I said. My shy friend, whose car was now running, was grinning. “Thank-you,” he said over and over. “You are most welcome,” I told him as I removed his cables and closed the hood. We were on the road a few minutes later, none the worse for the wear. We made it to the airport with time to spare, got checked in with only the normal amount of hassle, and found our gate. As we were relaxing, we looked at each other and felt like our troubles were over. And they nearly were. An ice storm in Chicago delayed our arrival home by 3 hours, but we met some very nice people as a result of the delay. I hope our new friend didn’t shut his car off the next time he filled up with gas. This morning, while attempting to get through my morning chores, I caught myself just sitting and staring… probably for a pretty long time. When I came to, I felt like I’d awoken from a trance. It was below zero outside when we got up this morning, so my first order of business was to get the fires going. I started with the kitchen stove, and soon had the cedar kindling cheerfully crackling. 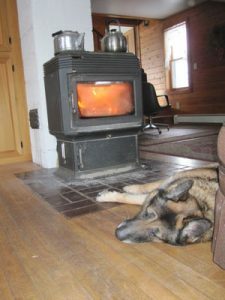 Then I moved on to the big Jotul stove that sits in the center of the livingroom. We usually don’t run the big Jotul unless the temperature is below the mid 20s. It had a fire all last night, but there were just a few coals left, so I had to split up some kindling and some hardwood into small slabs, and pile them criss-cross on top of the coals. Then I did something else for a few moments. When I returned, I blew on the coals, and the flames erupted. That is when I zoned out. The big Jotul has a glass door which, while not perfectly transparent, does allow a view of the fire. And what a view it is. Ever since I can remember, I’ve enjoyed watching fires. But when the house is cold and your feet are close to the fire, there is something extra special about just sitting and staring at the flames. When I recovered from my trance, I wondered how far back on my ancestral tree we have been doing just what I was doing, watching the flames. You’ll notice I was not alone at the hearth. I think if anything, Franco likes the fire more than I do. Tonight his head was almost touching the stove. I felt him just to be sure he hadn’t burned his brains out, but he just whapped his tail a couple of times to tell me all was well. I wonder if anyone has patented fire therapy? I would think that watching a fire, especially when it is cold outside, would be a cure for any and all known maladies. I forget the exact number, but in the first year or two we were married, Alice and I moved many times. We were dandelion seeds bouncing over the terrain, looking for a place to put down roots. In 1975 I got accepted for an undergraduate program at Michigan Tech, so we moved to the Copper Country. We knew Alice’s parents, who had recently retired to nearby Pelkie, but were completely on our own when it came to people our own age. I had a fortuitous encounter while doing my laundry at a laundromat in Hancock. It was shortly after we arrived, and I was busy with soap, quarters, and shuffling damp loads from here to there. A guy about my age walked in who turned out to be the facility’s mechanic, and started working on one of the machines. We were pretty much alone in that big place, so we started talking. It was Ken Steiner. Ken knew who Buckminster Fuller was, understood about tipis, yurts, natural foods, living in the country, The Whole Earth Catalog, etc. I came away from that encounter feeling like we’ll be ok here… that there are kindred souls. And we were ok. After I received a couple of undistinguished degrees, we both wound up with careers at MTU that lasted as long as we both wanted. We found enough acreage within commute distance from MTU so we could both work on our dream of life in the country, while maintaining our jobs and raising our son. Ken and I had sparse contact in the intervening years. Ken got into food service and was very good at it. Like me, he found a community outlet in volunteer work at Little Brothers. Ken did way more than I did, but we both wound up as lead chefs at our respective meal sites. Ken played the blues harmonica; a skill I admired him for. Ken learned about his heart problems a few months ago. This culminated in an open heart surgery in Marquette that would save his life. He went through the surgery with the grace of a dancer. He posted pictures on Facebook of a tired man that was well and truly on the mend. This morning we learned he lost that battle. I miss you Ken. You showed me there was fertile soil in the neighborhood for a misfit like me. My roots run grateful and deep, thanks in part to a helping hand from you early on. You are currently browsing the Rural Life in the UP of Michigan blog archives for January, 2017.